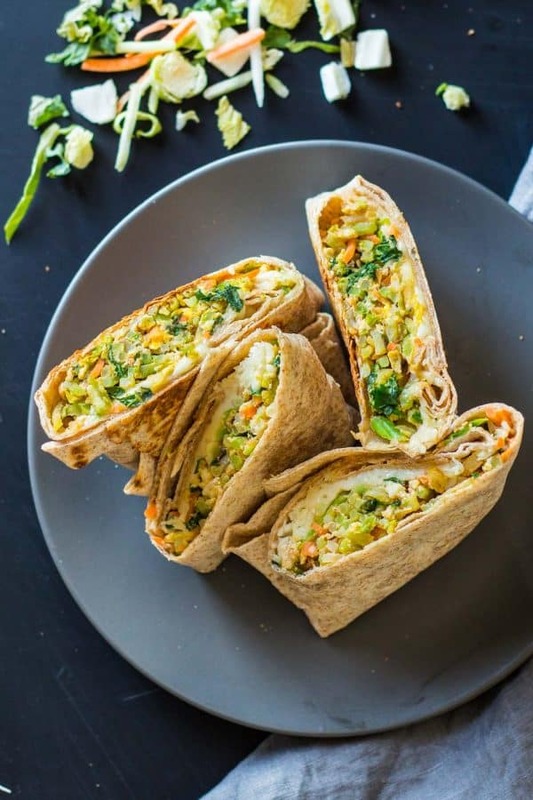 This Healthy Breakfast Burrito Recipe is perfect for hectic mornings. Prepare several burritos ahead for the week or month, refrigerate or freeze and then just reheat and enjoy! What’s the best way to add vegetables to your breakfast? 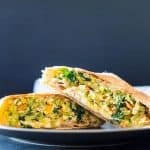 Make savory breakfast burritos! Add either eggs for protein or chicken breast, tons of veggies and some cheese and you’re good. 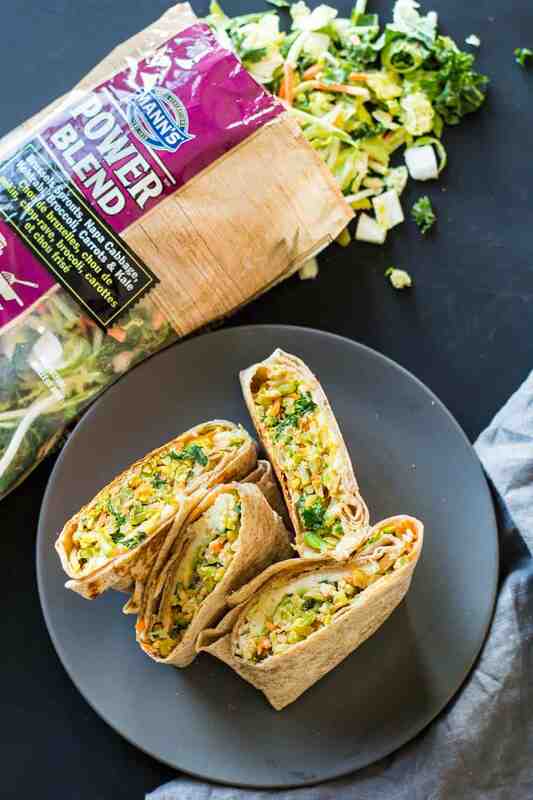 To make it easy and quick use an already prepped veggie slaw like Mann’s Power Blend. 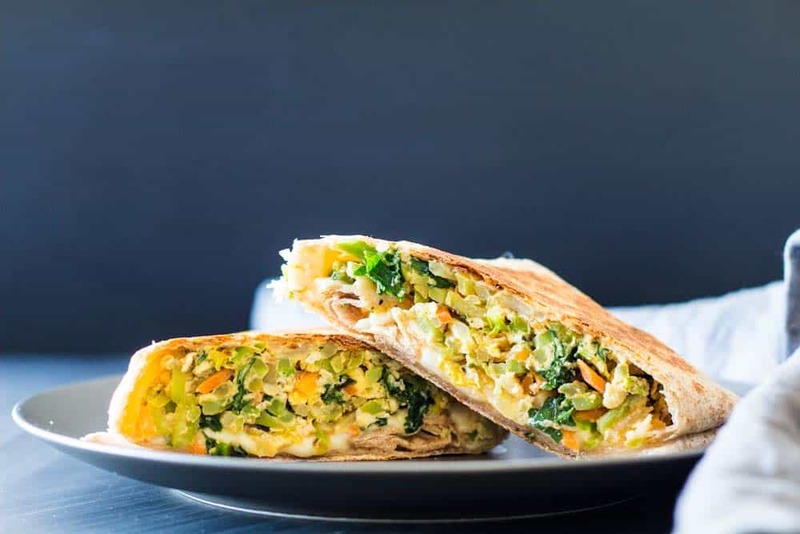 It contains multiple super foods like kale, kohlrabi, Brussels sprouts, Napa cabbage, carrots and broccoli. A breakfast burrito filling for champions. Another delicious recipe with a ready made slaw is this Stuffed Spaghetti Squash that is beyoooond delicious! You can basically add anything you like but I like finely chopped veggies with egg and cheese the best. Veggies for vitamins, minerals and antioxidants. Eggs for protein and cheese as healthy fat, “glue”, and deliciousness all in one! Ever since creating this recipe my husband has been following it on a weekly basis making himself 7 burritos for the week. 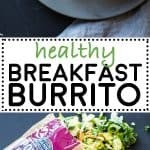 Can I Freeze Breakfast Burritos? Bare in mind that you can refrigerate them for 3-4 days so if you plan on making more you will have to freeze the rest to make them last longer. Big big shout out to this amazing company for sponsoring this post. You are awesome! 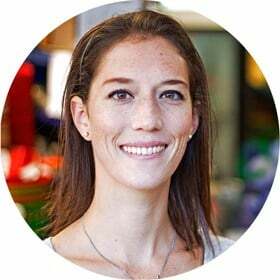 I am so happy I was given the opportunity to create a recipe for you! It was a real pleasure to come up with this breakfast burrito recipe. And thank YOU, my lovely readers, for supporting the brands that support Green Healthy Cooking! I hope you love this healthy breakfast as much as I did! Make sure to tag @greenhealthycooking when you post a photo of your finished dish. I’d love to see! Heat a large pan over medium heat. Once hot, add oil and Mann's Power Blend and stir fry for a couple of minutes until it starts to soften. In a bowl whisk together eggs and spices, then add to vegetables in pan and stir fry until eggs are scrambled. Divide filling into 4 and add 1/4 to the center of each tortilla. For from the bottom into the center, then fold in sides and turn around. (Watch video for demonstration). Wrap in parchment paper and cling film and refrigerate for 3-4 days or freeze for up to a month. To reheat / defrost, use a press grill or toast in a pan heated over medium heat. This recipe was inspired by Sweet Pea’s and Saffron’s Burrito Recipe. I know that skipping breakfast is not a good idea for dieting. Having a wholesome breakfast is not only healthy and give full feeling for a long time. And this recipe would fit my requirement perfectly. Saving this to make it soon. Suja, I’m sooo happy you like this recipe! I absolutely loved the flavor combination and its simplicity!